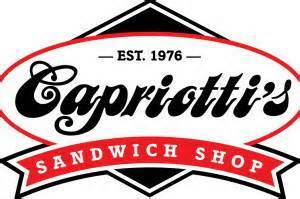 Open Daily at 10:00 A.M.
Their concept was to capture the hearts of ''real turkey lovers,'' an idea that would separate Capriotti's Sandwich Shop from almost all of its competition. They wanted to roast whole fresh turkeys overnight, a concept that no other sandwich shop in the area offered. They began by cooking one turkey per night, but the demand grew to the point where they were cooking 10 to 12 turkeys per night. They served sandwiches made-to-order with fresh roasted pulled turkey, the best quality meats and cheeses, and fresh rolls and produce delivered daily.